We all know how much I love roasting chicken and all the things you can do with it. Today I am so luck to have Jen from Life with Levi sharing one of her go to recipes. My new go-to meal idea is roasting a whole chicken. Mostly because it’s easy, and I don’t have a ton of time to cook lately. Here’s how to serve up a delicious meal for five on the cheap without spending too much time in the kitchen, based on a recipe from Busy Cooks. 1) Buy a whole chicken when they’re on sale. If you have the freezer space, buy a few. They last forever in a deep freezer. I try to stock up when they’re marked down to $0.99/lb. Buy the biggest one you can find (usually 5-7 lbs). Dump all the spices in your container, pop the lid on, and give it a quick shake. Store it in your cupboard or another dark, non-humid location. Rub the spice mixture all over the chicken. Place the chicken in a roasting pan, breast side down. I like to use a regular baking dish, because that’s what always near the front of my cupboard. Fill the cavity with the chopped onion. Toss a little butter and ¼ C of water in the bottom of the pan. Put the other veggies in another baking dish. Add ½ C water and cover them with tin foil. on the rack below the chicken. You’re going to bake this whole thing for about 4-5 hours. Using a timer is key. 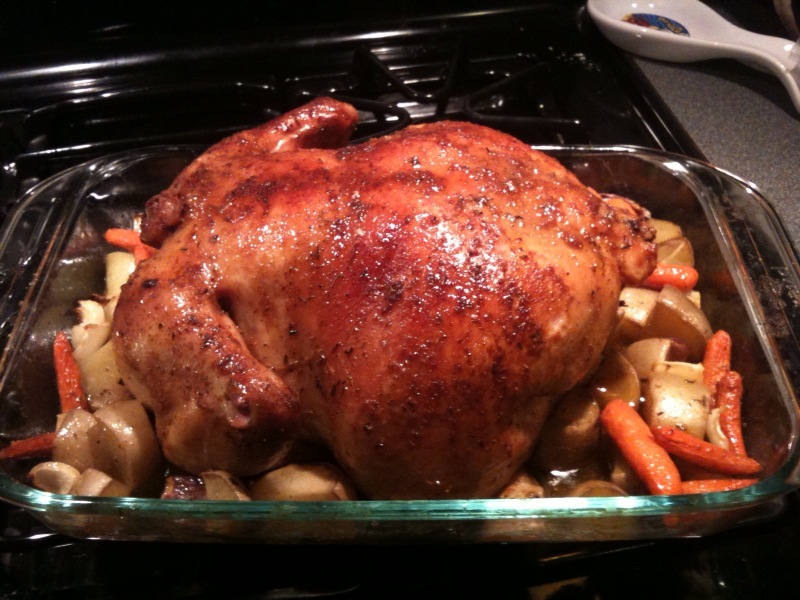 After the first 1 – 1.5 hours, baste your chicken with the juices from the pan. Continue basting every 30-45 minutes until your chicken reaches 175 degrees. Once the chicken reaches the proper temperature, pull it out of the oven and let it rest for at least 15 minutes before serving. Don’t worry, it won’t get cold. 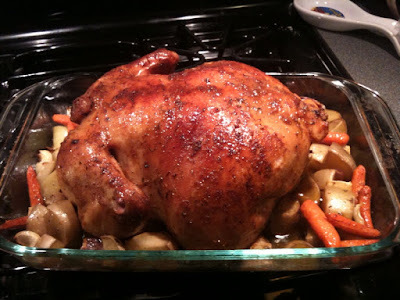 While the chicken is resting, pour some of the juices from the chicken pan over your potatoes and carrots. This photo shows the carrots & potatoes in the pan with the chicken – don’t do that. You can’t really tell from this photo, but I killed the carrots. Big time. They need to be covered while baking so they don’t dry out.